Summer's wrapping up. I can't believe how fast the time went by. Last spring, I was really worried about the summer. How would I keep 2 little kids (age 6 and 1 1/2) entertained all summer without sticking them in front of the television or running myself ragged with exhaustion. I'm not sure how we did it but we pulled it off. Nicholas said this was his best summer ever...and I would have to agree. We did almost everything on the list of things he wanted to do this summer, plus some! We stayed home some and did the usual arts and crafts like coloring, painting, and playing with Play Doh. We had friends over to play. We went to friends' houses to play. We walked to parks and drove to other parks. Lots of parks and playgrounds. We went to Going Bonkers. We jumped in bounce houses. We toured our local Blue Bell. Nicholas watched a race at Texas Motor Speedway. We visited a farm. We grew our own peanuts, tomatoes and peppers. 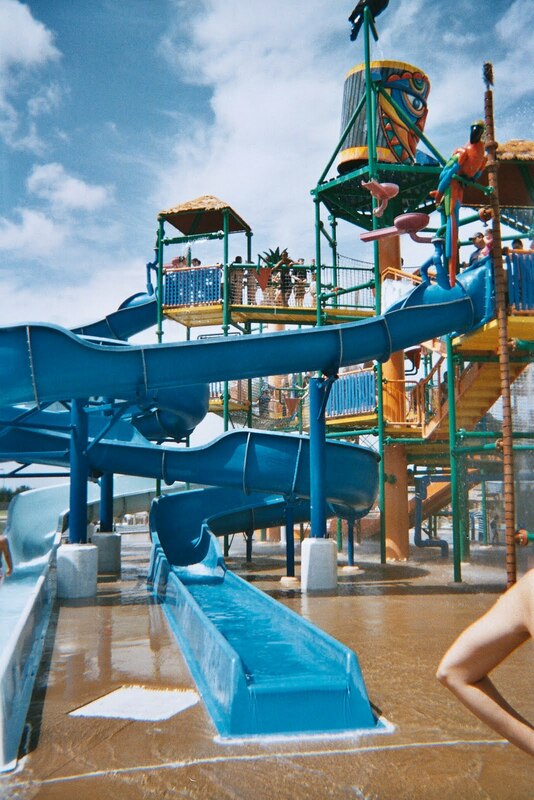 We joined a gym with a cool rock climbing wall and swimming pool with water slides. We participated in the Texas Nature Challenge and took nature walks at various parks and nature preserves around the Metroplex. We picked our own blueberries. We climbed a tank in Plano. Nicholas attended soccer camp. We grew silk worms and prehistoric sea monsters. We went fossil hunting a few times. We went to Rita's Italian Ice regularly. Granddad came to visit. We started hunting for a new church. Nicholas continued his karate lessons. We went to the zoo. We went to the library. We ate watermelon. We went to the sno-cone stand a lot then our neighbor gave us an ice shaver and we made our own sno-cones. We watched planes go by and clouds change shape. We went to museums. We completed astronaut training. We went bowling. We watched the stars and the moon. We traveled and visited family in Baton Rouge (we ate boudin! ), NASA in Houston, the beach on North Padre Island, an aircraft carrier in Corpus Christi, and Sea World in San Antonio. 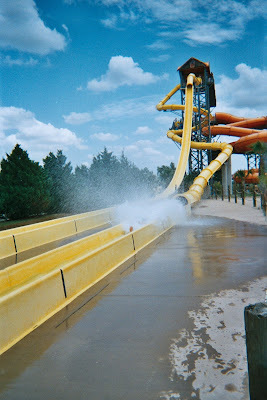 We went to lots of water parks as well as a trip to Hawaiian Falls with Nicholas' cub scout group. Hawaiian Falls has a cool kids area with lots of water slides, sprays, buckets dumping water on you, etc. Nicholas and Daddy played in the wave pool and relaxed in the tubes as they floated down the lazy river. 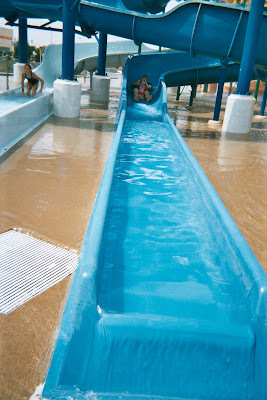 And Rachel had a total blast on her first "big" water slide with Daddy. Big grin from ear to ear. 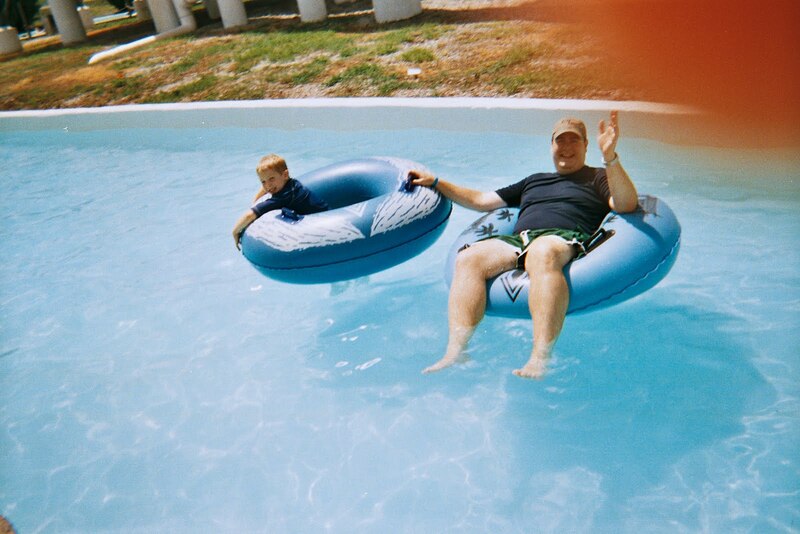 Even Daddy and I had fun on the "grown up" water slides. This one was a doozey. It seriously doesn't look scary but you are fighting G forces as you are speeding down this thing. It's a wild ride! Of course, summer calls for ice cream. And what better ice cream is there than the homemade kind? It's just so "summer". We let Nicholas decide on the flavor we made. He chose Kit Kat ice cream. So we made a basic vanilla ice cream recipe and then added tons of chopped up Kit Kat pieces to it just before it was done. If you going to go to the trouble of making your own ice cream, then you might as well kick it up a notch further. We made sundaes with bananas, chocolate syrup, whipped topping, cherries, and, of course, a little more Kit Kat just for good measure. Rachel was quite pleased with the ice cream too even though a lot of it dripped on her tummy. We also had lunch at Rainforest Cafe. It's a neat little restaurant that kids love. It's dimly lit and moss and vines cover the walls and ceilings. Surrounding you in the restaurant are realistic-looking animals that move and make sounds throughout your meal. It's like you were transported to the middle of the jungle and you have to pinch yourself to remind you that you are still in the DFW area. Ok, not really but the food is good and you can always get great coupons for their kids meals. Both kids loved looking at all the animal toys for sale while we waited for our table. Rachel spent a lot of time watching the fish in the giant tanks. I was amazed that Rachel didn't get scared of this crocodile outside the restaurant. She gets frightened easily and this thing growls and leaps forward. She stared at it a lot but never even had a scared look on her face. Summer 2010 rocked! Sorry to see it slip away but we have tons of pictures and stories to help us remember. Happy First Day of School, Nicholas! Pepsi Refresh: Please Vote for IRSF! What Do You Do When It's 107 Degrees Outside?